Watch the highlights from Collingwood's 25 point win over Essendon at Windy Hill and hear from Paul Seedsman, Kyle Martin and Taylor Adams. Watch the highlights from Collingwood's 25 point win over Essendon at Windy Hill and hear from Paul Seedsman, Kyle Martin and Taylor Adams. Kyle Martin speaks to the ABC's Phil Cleary on camera after the game. Photo: Shane Barrie. When Collingwood meets Essendon in round 17 later this year, the match committee would be wise to consider Kyle Martin when they select the team. He has kicked a total of 12 goals in his last two meetings with the Bombers at VFL level and on both occasions has been awarded the Bluestar Medal as best afield. Of course we’re being facetious, but sustained excellence such as Martin’s doesn’t go unnoticed. His six goals from the midfield made him the standout performer in the Magpies’ 25-point win over the Bombers at Windy Hill on Saturday afternoon. As coach Dale Tapping told reporters after the match, Martin has been steadily working his way back to his best since playing his first match of the year in the final practice match against Bendigo. “He’s been playing good footy but today he got back to his outstanding form that we’ve seen in the last year,” Tapping said underneath the Cookson Stand after the win. “In the corresponding game against Essendon last year he had a good day too. “He was really good last week; he sort of built into it. He’s been playing well but today he was back to that dynamic player. He’s so smart around the ball and forward of the ball so today I think we saw him get back to what we saw last year. Recap collingwoodfc.com.au's live coverage of Collingwood's 25-point win over Essendon. 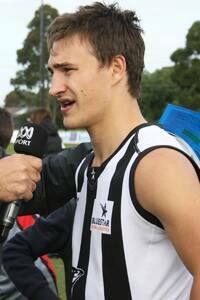 Martin headlined a VFL team laden with AFL-listed talent. From old hands Ben Hudson and Quinten Lynch to recent recruits Taylor Adams and Sam Dwyer, Tapping’s team had big names on every line. The match threatened to be a blow out when Collingwood opened proceedings with a five goal to nil first term and had the game in its keeping when it led by 36 points at the half. But the Bombers made the Magpies think twice in the second half, closing the gap to just 15 points midway through the final term. Fortunately, Martin and Patrick Karnezis (four goals) were on hand to ensure the Collingwood ship was steadied and steered towards a comfortable 25-point win. “It was a great result for us,” Tapping said. “I think we’re starting to play some good footy. It’s been a good weekend for the club really with the win yesterday so it’s been good. “We knew they would (comeback). We spoke about it at half time. “I asked the group where they thought the game was at and what do you anticipate them doing. When you’re six goals down there’s only one thing you can go and that’s break the game open. They took the game on and showed some courage with the risks that you take. They weren’t going to sit back and watch the game unfold. So that challenge was going to come. “And then we got limited with the players and we had to try and cover run, it sort of challenges you a bit. But it was good. Rover Sam Dwyer showed he’s ready for senior action should the call come from the match committee in the coming weeks. As ever, his sure ball handling and slick sidestepping in traffic meant he was one of the standout players on the field. “Sam’s ready, I wouldn’t have thought he would be far away from playing,” Tapping said. The day’s headline act was the return of several players from prolonged layoffs. Marley Williams and Tim Broomhead (wrist/shin splints) made their first appearances since the first NAB Challenge match of the pre-season while Paul Seedsman slotted back onto a wing for the first time since undergoing hip surgery in January. Tapping had praise for all three for the way they approached their return to the state league. “He (Williams) has great speed and he didn’t really run out of gas. He’s been doing all the work but the one thing he hasn’t been able to do is actually play. “He got the opportunity to play today after having to sit out for a number of weeks so it’ll be onwards and upwards from him. “He came on and attacked the footy. His overlap run was at AFL standard. He was very good when he was on the ground. So I suppose it’s the decision for the senior members of the match committee so I suppose it’s possible. He could be a chance, who knows. “Seedy only played a half. He was good and played what he had to play in terms of his game time. “With Broomy we were probably fortunate enough that we were allowed to play him a bit longer. And it really helped us because he had a bit of an influence in the last quarter. “He’s a really smart player and we really needed an extra body at that point in time so it was nice to have him for a bit longer than we thought we would. We were at the risk of playing one short. So he was really good and as you saw in the last quarter he looked pretty dangerous jumping at the footy and at ground level he looked like he was catching them off guard. An unfortunate footnote to the result was the injuries sustained by Quinten Lynch and Corey Gault. Lynch has a suspected broken leg and Gault a suspected broken collarbone. An update on the fitness of the pair will appear on collingwoodfc.com.au during the week.